Sure he doesn’t talk much at all. He seems in his own world at times, and getting his attention can often be quite the challenge. He would rather push you down the slide than talk to you or listen to you. It’s because he likes to watch things go down the slide — not because he likes to push people. You are just furniture in his life. So I can see how one would then possibly come to the conclusion that he is not very smart. Mentally retarded. Not aware of what is going on, etc. 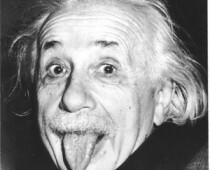 Einstein was a late talker and some think he may have had autism. As well as many other great minds throughout history including: Nikola Tesla, Thomas Edison, Isaac Newton, Mozart, Beethoven, Van Gogh, DaVinci .. the list goes on and on. They were absorbed in their work and often times anti social and what most people would consider “weird”. And yet we recognize them as geniuses who changed the world. He is just ignoring you. He has other things that he is interested in instead of communicating or socializing with you. Don’t get me wrong, he does communicate — he talks and uses sign language and is improving everyday — and he does like to be social. He loves his family and loves having people around. And tickles. And hugs. And dancing and singing with me. Just because he is ignoring you doesn’t mean he isn’t aware and he doesn’t have intelligent thoughts. It probably just means you aren’t as interesting as watching himself dance in the mirror, or Elmo, or the iPhone.